[164 Pages Report] Tunnel Automation Market categorizes global market by Component (HVAC, Lighting & Power Supply, Signalization), Offering (Hardware, Software, and Services), Tunnel Type (Railway Tunnels and Highway and Roadway Tunnels), and Geography. 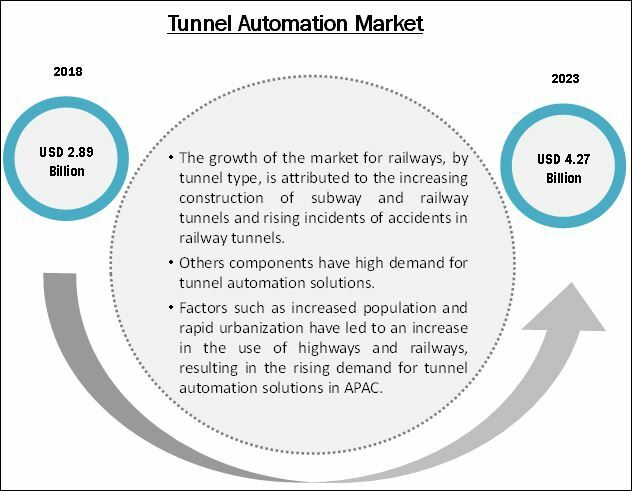 [164 Pages Report] The overall tunnel automation market was valued at USD 2.68 billion in 2017 and is likely to reach USD 4.27 billion by 2023, at a CAGR of 8.12% from 2018 to 2023.The growth of this market is mainly driven by factors such as rising incidents of road accidents, tightening government regulations for the deployment of tunnel automation solutions, and growing integration of IoT and cloud into tunnel automation solutions. However, the lack of technically skilled labors for the installation and monitoring of tunnel automation solutions restrains the growth of the tunnel automation market. The base year considered for the study is 2017, and the forecast has been provided for the period from 2018 to 2023. Others components are expected to account for the largest share of the tunnel automation market during the forecast period. The growth of the market for these components can be attributed to the high requirement for other components, including fire detection, traffic management, central control and monitoring, video surveillance, incident detection, communication, and gas detection systems, in tunnels for providing safety and security to all passengers traveling through and operators working in highway, roadway, railway, and subway tunnels. During this research study, major players operating in the tunnel automation market in various regions have been identified, and their offerings, regional presence, and distribution channels have been analyzed through in-depth discussions. Top-down and bottom-up approaches have been used to determine the overall market size. Sizes of individual markets have been estimated using the percentage splits obtained through secondary sources such as Hoovers, Bloomberg BusinessWeek, and Factiva, along with primary respondents. The entire procedure includes the study of the annual and financial reports of the top market players and extensive interviews with industry experts such as VPs, directors, and marketing executives for key insights (both qualitative and quantitative) pertaining to the market. 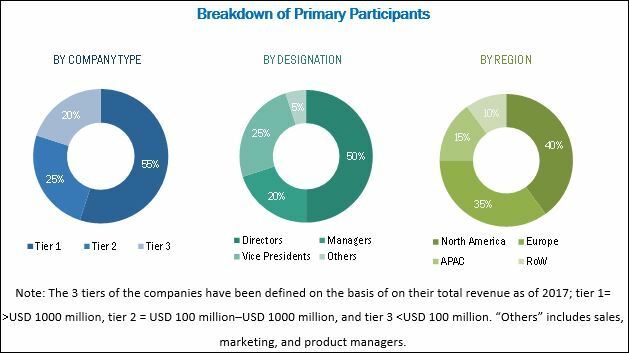 The figure below shows the breakdown of primaries on the basis of company type, designation, and region considered during the research study. 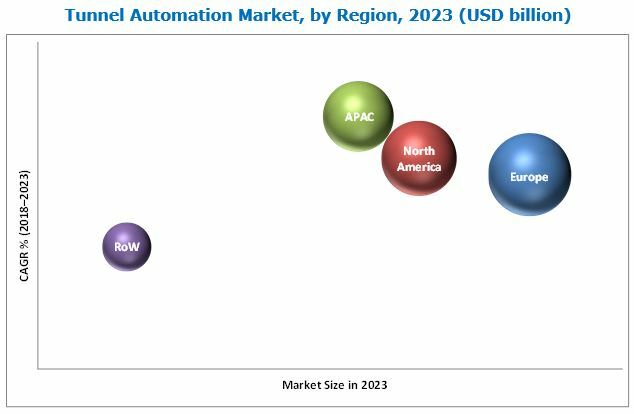 The tunnel automation market comprises a network of players involved in R&D facilities, raw material suppliers, OEMs, system integrators, suppliers and distributors, and end users. Key players considered in the analysis of the tunnel automation market are Johnson Controls (Ireland), Siemens (Germany), Trane (Ireland), SICK AG (Germany), ABB Group (Switzerland), Kapsch (Austria), Philips Lighting (Netherlands), Honeywell (US), Eaton (Ireland), and Swarco (Austria). What new application areas are being explored by tunnel automation solution providers? Who are the key players in the market, and how intense is the competition? The overall tunnel automation market is expected to grow from USD 2.89 billion in 2018 to USD 4.27 billion by 2023, at a CAGR of 8.12%. Rising incidents of road accidents, tightening government regulations for the deployment of tunnel automation solutions, and growing integration of IoT and cloud into tunnel automation solutions are the key factors driving the growth of this market. Tunnel automation solutions comprise a broad set of technologies that enable the monitoring and management of tunnel environments in extremely harsh conditions by providing a continuous stream of information. Increasing incidents of fatal accidents in tunnels is a growing concern for several governments and tunnel management authorities worldwide; they are focusing on adopting tunnel automation as a solution to avoid accidents inside tunnels. Different components of tunnel automation include HVAC, lighting & power supply, signalization systems (traffic control, public announcement, and alarm systems), and other components (fire detection, traffic management, central control and monitoring, video surveillance, incident detection, communication, and gas detection systems). The tunnel automation market has been segmented, on the basis of tunnel type, component, offering, and region. Other components are expected to account for the largest share of the tunnel automation market during the forecast period. The growth of the market for others component can be attributed to the high requirement for these components, including fire detection, traffic management, central control and monitoring, video surveillance, incident detection, communication, and gas detection systems, in tunnels for providing safety and security to all passengers traveling through and operators working in highway, roadway, railway, and subway tunnels. Europe is likely to account for the largest share of the tunnel automation market during the forecast period. The growth of the market in Europe can be attributed to the presence of well-established manufacturing industries, increased demand for public transport in most cities, and presence of several mountain ranges in the region. The lack of technically skilled labors for the installation and monitoring of tunnel automation solutions pose major challenges for the players in the tunnel automation market. Key players in the market include Johnson Controls (Ireland), Siemens (Germany), Trane (Ireland), SICK AG (Germany), ABB Group (Switzerland), Kapsch (Austria), Philips Lighting (Netherlands), Honeywell (US), Eaton (Ireland), and Swarco (Austria). These players are increasingly undertaking strategies such as partnerships, contracts, and expansions to develop and introduce new technologies and products in the market. Where will all market developments take the industry in the mid to long term? What are the upcoming industrial trends in the tunnel automation market?